Amaferm® stimulation of the beneficial microorganisms in the rumen converts to significantly more digestion of feed. Ultimately this increased digestion converts to more VFAs for energy and more microbial protein as a source for quality protein. The increased energy and protein help the dairy cow meet her increasing needs so she can do her job – produce more milk. In fact, Amaferm® has been proven to increase milk production in early lactation by 7%. Lactating dairy cows are high-performance animals, and as such, they require a tremendous amount of nutrients. These nutrients are required to support basic life functions, known as maintenance, as well as the production of milk. The energy and protein requirements of a dairy cow increase tremendously as milk production increases. Milk production alone results in the largest change in energy needs. For every 10-pound increase in milk production, 3.2 more Mcal of NEL is required. What the animal does with the additional energy made available by Amaferm® depends on their age, stage and level of production. Let’s start at the bottom of the triangle and talk about WHERE you will see more milk in the tank. On average, Amaferm® is proven to increase milk production in early lactation by 7%. That’s a lot of heavy lifting for 20% of the herd. 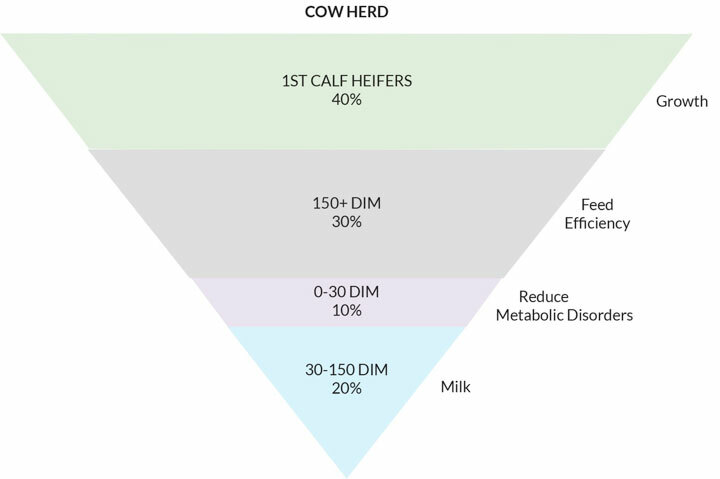 Approximately 10% of the herd is in the transition phase, 0-30 Days in Milk. 50% of animals in this phase experience some sort of metabolic disorder – and 30% of all cows culled occur during this time. The extra energy made available by Amaferm® during TRANSITION supports a healthy transition. Moving on to cows in mid-late lactation, additional energy here translates into reduced Dry Matter Intake. Amaferm® research shows these cows will produce the SAME amount of milk on LESS feed. Typically 40% of the herd is first calf heifers who are spending most of their energy on growth. While heifers will likely partition the additional energy to growth, there will be positive benefits with Amaferm® in reproduction and milk the following years. 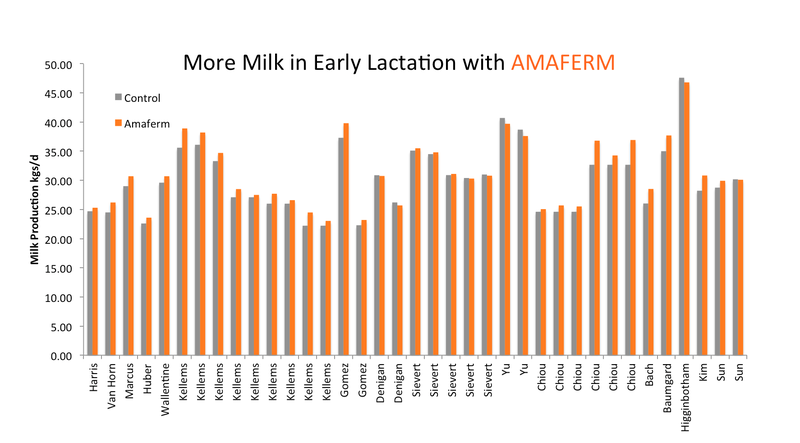 Amaferm®‘s 7% increase in milk in early lactation is logical when you look at how Amaferm® INCREASES Dry Matter Intake in early lactation, and REDUCES weight loss… It shortens the length of time cows are in negative energy balance and drives milk. Factor in that every 1kg increase in PEAK MILK will give an additional 200kgs throughout the rest of the lactation…increases here can be significant to the bottom line. In early lactation Amaferm® drives DMI and reduces weight loss. Conversely, in late lactation, when cows are in a positive energy balance and cow weight is restored, Amaferm®‘s impact on Dry Matter Intake has been shown to primarily increase feed efficiency through a reduction in feed intake. What the animal does with additional energy made available by Amaferm® depends on their age, stage and production level. Typically, 40% of the herd is first calf heifers. While heifers will likely partition the additional energy to growth, there will be positive benefits with Amaferm® in reproduction and milk the following years. In multiple studies, Amaferm® resulted in increased milk production of 5.4% even during times of heat stress. In the below results from a 2003 transition study by Baumgard at the University of Arizona, heifers were working hard to maintain body condition and Amaferm helped out with less body weight loss. Further proof of Amaferm’s impact is the fact that it took fewer weeks to go from a negative energy balance to positive energy balance (week of BW Nadir). Amaferm worked 8 days sooner or caused 23% fewer days in negative energy balance. That’s a lot less nutritional stress. Low concentrations of NEFAs are found in the blood of healthy animals. Increased concentrations indicate breakdown of fat, which occurs in response to increased energy demand. Thus, NEFAs are considered a biomarker of negative energy balance, where the supply of glucose is insufficient to meet energy needs. Negative energy balance can be detrimental because it predisposes animals to fatty liver ketosis. Amaferm lessened the negative energy balance in this study. Even with much of the energy going to body condition, Amaferm resulted in an increase in milk production over control. The increase in milk with relatively the same amount of dry matter intake translates to increased milk efficiency with Amaferm. The Somatic Cell Count (SCC) is a main indicator of milk quality. The majority of somatic cells are leukocytes (white blood cells) – which become present in increasing numbers in milk usually as an immune response to mastitis. Amaferm resulted in a lower SCC indicating better animal health and ultimately more milk yield. This study showed many positive benefits to feeding Amaferm in the dairy. Heifers will tend to partition energy to GROWTH and then components and milk. With the increased energy from Amaferm® to support growth demands, you should see positive benefits with Amaferm® in milk persistency, but also reproduction and milk the following years. When adding Amaferm® to the whole herd – when looking in the tank just remember – that this is typically about 40% of the herd. Cows on their 2nd calving may still be partitioning a little energy to growth, but multiparous cows will generally be done growing and can partition more of their energy to milk. Cows not needing energy to repair or recover body condition will generally partition energy to milk. Increased energy from Amaferm® will help create more nutrient availability to support milk. Cows in Average Body Condition will still tend to partition energy to milk. Increased energy from Amaferm® will help create more nutrient availability to support milk and weight gain. Except thin cows in early lactation, we would typically expect cows on the thin side to partition energy to weight gain. Amaferm® is proven to increase NDF digestion on average 17.3% to help cows get the most out of whatever is being fed. Amaferm® DRIVES 7% more milk in early lactation. Amaferm® INCREASES Dry Matter Intake in early lactation, and REDUCES weight loss . . . it shortens the length of time cows are in negative energy balance and drives milk. Factor in that every 1kg increase in PEAK MILK will give an additional 200kgs throughout the rest of the lactation . . . increases here can be significant to the bottom line. Typically we will see an increase, not to the same levels as early lactation, because some of the energy will still be partitioned to body condition and we will see a decrease in intake because energy is not as limiting. In late lactation, when cows are in a positive energy balance and cow weight is restored, Amaferm®’s impact on Dry Matter Intake has been shown to primarily increase Feed Efficiency through a reduction in Feed Intake while producing the same milk. On high quality forages that are passing through very quickly – dry matter intake is not limited and they are able to produce milk to their genetic capabilities. Since energy is not limiting, we tend to see the addition of Amaferm® lower intake, with the cows producing the same amount of milk. Amaferm®’s effect is most noticeable when energy is limited. When low quality forage is your only option, Amaferm®’s 17.3% average increase in NDF digestion helps cows get the most out of whatever is being fed. Since energy isn’t limited, we tend to see the addition of Amaferm® lower intake, with the cows producing the same amount of milk. Amaferm® is proven to increase Milk 5.5% during heat stress. What does this look like in the tank – milk doesn’t drop as much as control. Cows consume more feed, have higher water intakes and lower body temperature. Typically we do not see a milk improvement in the Fall when cows are recouping body condition lost during summer. The additional energy from Amaferm® tends to be partitioned to Body Condition. Because cows have regained Body Condition in the fall. Amaferm® will help increase digestion of early fermented feeds and tendency is to see more milk. Typically, Spring Flush means more milk. More milk means more energy needed – Amaferm® provides the extra energy. Physical fill limits first calf heifers. Amaferm® helps to increase digestion and rate of passage so they can eat more. 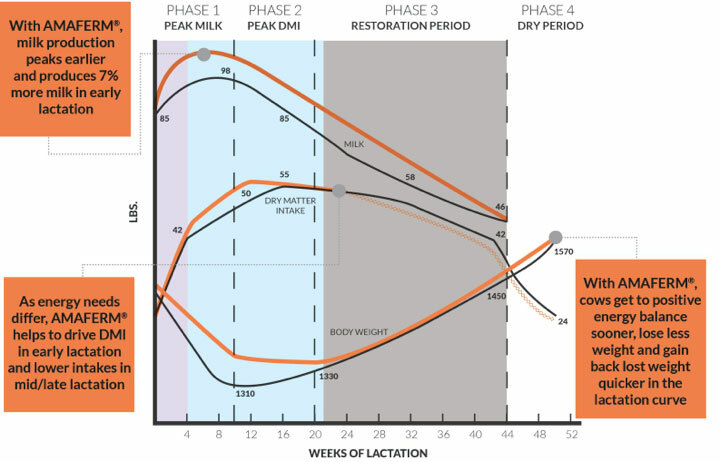 Over total lactation, multiparous cows in good – average body condition will tend to increase DMI in Early Lactation and lower DMI in Late Lactation. Amaferm® is proven to increase NDF digestion on average 17.3% to help cows get the most out of whatever is being fed. This increase in digestion also means they can eat more to increase energy for body condition. Amaferm® increased DMI in 7 of 11 Trials looking at DMI in Early Lactation. Less energy will be partitioned to support body condition and we will see a decrease in intake because energy is not as limiting. In late lactation, when cows are in a positive energy balance and cow weight is restored, Amaferm®’s impact on Dry Matter Intake has been shown to primarily increase Feed Efficiency through a reduction in Feed Intake. Energy is not limiting – animals are able to meet requirements on less feed with Amaferm®. Physical fill limits DMI on poor quality forages. Amaferm® helps to increase digestion so they can eat more. There is a tendency for cows to experience SARA during summer months, which is generally associated with decreased DMI and poor rumen function. Amaferm® helps to stabilize pH and drive DMI. Amaferm® increases fiber digestion which leads to an increase in butterfat. Research shows that this is not from body condition loss, but from de novo synthesis of milk fat. Milk fat production requires a lot of energy. The tendency would be for cows on the thin side to use acetate and butyrate to increase body weight instead of milk fat. There is a tendency for cows to experience SARA with low forage diets, which is generally associated with decreased milk fat. Amaferm® helps to stabilize pH and drive butterfat. Heifers will tend to partition energy to GROWTH and then components and milk. Amaferm® increases energy available to help support growth demands. Cows on their 2nd calving may still be partitioning a little energy to growth, but for the most part, multiparous cows will partition more of their energy to milk. Energy is not needed to Body Condition will be partitioned to milk and components. Thin cows will partition extra energy to Body Condition first, then to milk. Amaferm® INCREASES Dry Matter Intake in early lactation, and REDUCES weight loss . . . it shortens the length of time cows are in negative energy balance. Maintenance requirements go up during the summer because of heat and the increased energy will help meet these needs where cows won’t have to mobilize body condition in order to maintain. Cows are recouping body condition from summer loss. With Amaferm®, cows will replenish body condition faster so that cows can increase in milk production sooner. Cows have already regained Body Condition in the fall and extra energy can be portioned to milk. Cows are still in good Body Condition and extra energy can be partitioned to milk.